Yep another birthday today. Gracie my oldest daughter is 9. This is the best picture she would let me take today. At 9, she's not always cooperative. Aren't all kids like that at some point? 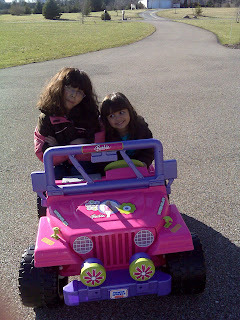 The girls were busy today after school riding on the Barbie power wheels. All I can say is, that I'm jealous I didn't get to ride! This weekend we are going to have a proper 'party' with a cake and everything so I will post about it then. We ordered mexican take out and just chilled. On top of all that, my quilter delivered my next MBS quilt! I love it sooo much, I mean this is my favorite Moda line right now...favorite. My husband loves it too. That makes me happy...'cause maybe he will let us put it on the bed LOL. Happy Birthday Grace! Enjoy your birthday party this weekend! And can't wait to see the next MBS project! Happy Birthday to Grace!!! Can't believe she is 9 already! And what a cute Barbie car, I'll bet they love it. BTW, where is all the snow? Gosh, two birthdays so close...your house is busy this time of year! Moda packages are my favorite! Can't wait to see what you have come up with. Is 9 considered to be a "tween?" Happy 9th birthday Grace! What a fun day to ride around in the Barbie car. What a fun day for you to get a box of fabric!! Happy Birthday Gracie From Canada Have a great party this weekend. 9 can be obstinate...my granddaughter has been 9 for 9 months now and there has been changes...like tween things! Don't you love this weather? Moving on to Easter and Spring how about you?